Today we’d like to introduce you to Willet and Diane Feng. Diane and Willet met as college students at Rice University in the early 2000’s. Upon graduation, Diane intended to pursue a Ph.D. in Sociology at the University of Washington in Seattle, so Willet moved there with her with the intention of finding a finance-related job. With no job offers in the site, he decided on a whim to apply to sushi restaurants, and he managed to snag a kitchen job at I Love Sushi on Lake Union. With no prior kitchen experience, he quickly learned the ropes at the sushi restaurant. Part-way through Diane’s schooling, she decided to switch her career focus from becoming a professor to becoming a school teacher. So Willet and Diane moved back to Texas for more schooling: Diane at the University of Texas in Austin for their UTeach teacher certification program and Willet at Le Cordon Bleu in Austin for culinary training. After they both received their degrees, they moved back to Houston. Diane worked at a local middle school, and Willet worked as a personal chef for a former Houston Rockets player. He then jumped from that position to become a cook as part of the opening team of Oxheart. After a couple years in Houston, Diane and Willet moved to Shanghai. Diane taught math at an international school, and Willet was the head chef at a restaurant called The Grumpy Pig. After a year and a half, they moved back to Houston to have their first child. Willet’s goal upon moving back to Houston was to open his own place. He envisioned opening up a Southeast Asian restaurant since he has fond memories of that cuisine as a result of living in Southeast Asia as a teenager, but he had trouble finding a viable location. Two industry friends—David Buehrer of Greenway Coffee and John Peterson of Rice Box—tried to convince him to take over a burger spot in the underground food court at Greenway Plaza. Willet originally was not sold on doing burgers, but the family-friendly weekday lunch hours and relatively quick turn-around time to get the place up and running were selling points that won him over. He officially opened Kuma Burgers in April of 2016. Diane originally had no intention of working at the burger restaurant, but a front-of-house employee had a family emergency and couldn’t show up for the first day of work. So Diane asked the in-laws to watch their daughter and she jumped behind the counter…and she’s been working the counter ever since. In November of 2016, another restaurant filed a cease-and-desist order against Kuma Burgers over the restaurant name for trademark infringement. They did not agree with the claim, but unfortunately, they did not want to risk a lawsuit so they opted to change the name to burger-chan. Yes and no. Every restaurant has its hiccups, and we are no exception. While our location does have the benefit of a captive audience (we’re in an office building’s food court), there are expectations on the price and speed for a business lunch. As a result, we’re operating on thin margins with a menu designed for speed – not exactly my dream operation, but at least we’re doing it on our own terms. Staffing has and will always be a struggle. As mentioned above, we had someone not show up on our very first day! While we’ve been lucky to attain a solid team overall, life happens, and even superstar staff members call in last minute or have to leave in the middle of service. But like any restaurant, we just make it work. Please tell us about Burger-Chan. 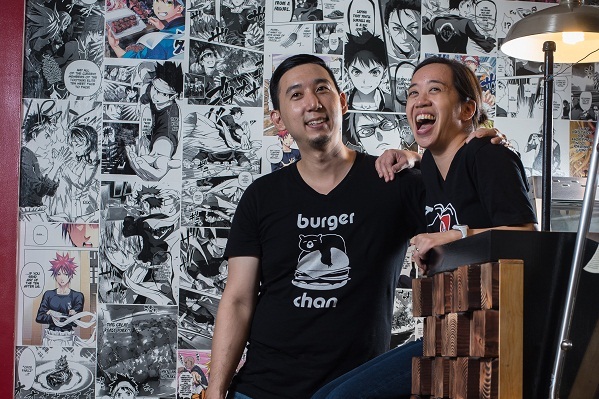 Burger-Chan is a burger restaurant in an underground food court in Greenway Plaza. We also serve other items, but we have received favorable reviews from the local press for our burgers and our milkshakes. What sets our menu apart is that customers can customize the burgers, dogs, and other sandwiches from top to bottom. There are also a few items on the menu that are not offered at any other burger restaurant, like the house-made gluten-free rice buns, kimchi relish, and sambal mayo. What sets our burger restaurant apart is that it’s chef-driven. Willet takes no shortcuts, and he does almost everything by hand and from scratch. On a daily basis, he and the staff cut the produce, make the sauces, and hand-form the patties. The veggie burger is also made in-house from soy-marinated Chinese eggplant steaks that are panko-breaded and then fried. We make our own ice cream base for our milkshakes. We are proud to be one of the only food court restaurants named on Alison Cook’s top 100 list for two consecutive years. I would have consulted with more industry friends on everything. Being impatient and not wanting to bother people too much has led to numerous setbacks, many of which could’ve been avoided. Also, trademark your business name before opening, even if you feel like the name you chose is safe from infringement claims. And finally, question anyone or thing asking for money – insurance, security, even the workplace posters – most of them are scams or grossly overpriced. As a business owner, you are a prime target!